AstraZeneca’s immunotherapy drug Imfinzi has won a long waiting approval from the U.S. Food and Drug Administration (FDA) for use in lung cancer. 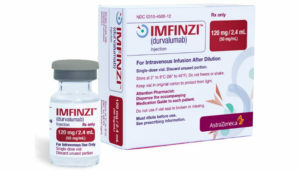 The approval is for expanded use of Imfinzi to treat non-small cell lung cancer patients with so called “inoperable mid-stage disease” – Stage 3 – that has not spread around the body very widely. The approval is based on the study’s results, which showed that Imfinzi can help prolong patients’ lives, the AstraZeneca’s said in a statement. The company also said this is a big breakthrough, since patients had no FDA-approved treatment options after chemoradiation therapy.